Modified 151 Spokeshave with shaving collector. It also makes a convenient stand when flipped upside down. Note that the shaving collector does not interfere with thumb or forefinger placement. 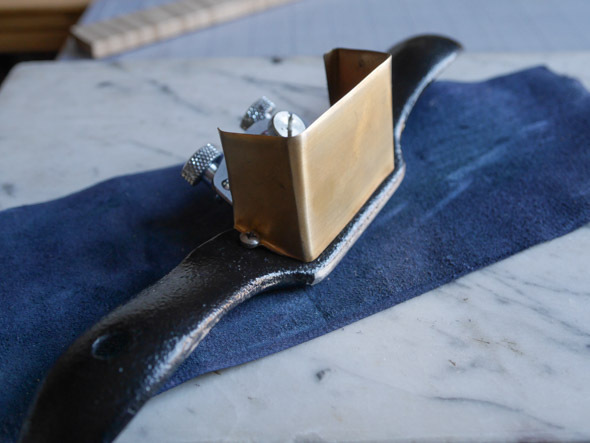 English trained bookbinders often use a modified spokeshave for long shallow bevels on the turn-ins, reducing the thickness in the spine area of a full leather binding, preparing a new piece of leather for rebacking, and for beveling binder’s board. I’ve improved the modified Stanley 151 spokeshave that I make and sell by adding a shaving collector. I first saw this on a spokeshave James Brockman was using in 1990. I can’t quite explain why it has taken me so long to get around to making one for myself — I’ve been busy??? He kindly shared details of the design with me, and mentioned he first saw this while working at Roger Powell‘s shop in the late 1960’s or early 1970’s. 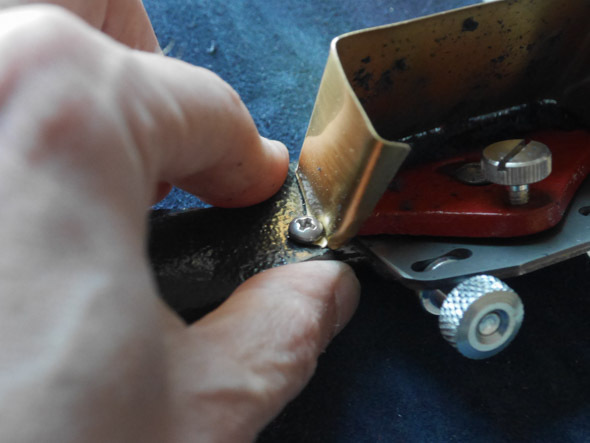 The shaving collector really speeds up work with the spokeshave, since you don’t have to stop and clean off stray shavings every couple of minutes, and they don’t get trapped under your leather, which can cause tearing or holes. Additionaly, it is easy to dump the full collector into the trash. More information about spokeshaves for leather. Even if you rough out the leather with Scharffix or Brockman leather paring machine, this spokeshave can quickly help reduce the ridges and unevenness the results from overlapping cuts and blade changes if you are working on large pieces. It is also essential for gradual bevels wider than the width of a double edge razor blade. And it is a lot of fun to use.